Molly is committed to helping clients navigate difficult transitions in their lives, and strives to deliver practical solutions, whether through negotiation or litigation. Prior to joining Griffin McCarthy & Rice, Molly practiced at another boutique family law firm, representing clients in all stages of divorce and parentage litigation. Molly has completed the Collaborative Law Institute of Illinois’ mediation training program, in order to serve clients seeking an alternative to litigation. In 2016 and 2017, Molly was selected by her peers as a Super Lawyers Illinois Rising Star in the area of Family Law. 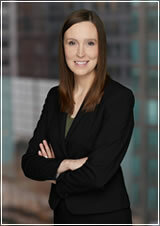 Molly received her Juris Doctor from Loyola University Chicago School of Law, with a certificate in Child & Family Law. While at Loyola, she participated in the Community Law Clinic, where she used her 711 law student license to represent clients in domestic relations and guardianship matters in the Circuit Court of Cook County. Molly also interned at the Domestic Violence Legal Clinic, where she advocated for domestic abuse survivors in divorce, custody, and child support proceedings. Molly received her Bachelor’s Degree (with honors and distinction) from the University of Michigan, where she studied sociology and women’s studies.